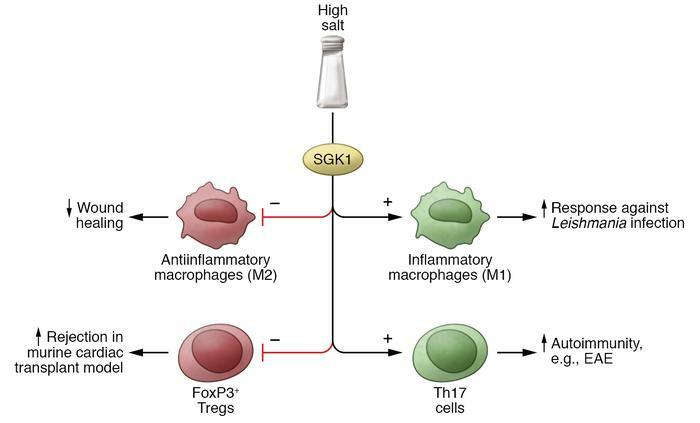 Effects of high salt on innate and adaptive immunity. High-salt diet may stimulate macrophages to differentiate into classical macrophages (M1), potentiating their effector function through NFAT5 activation and increasing the immune response against Leishmania infection. In a murine model of wound healing, high salt inhibits M2 differentiation through inhibition of mTOR/AKT signaling, leading to delayed wound healing. In adaptive immunity, high salt may potentiate Th17 cell differentiation and exacerbate disease in the experimental autoimmune encephalomyelitis (EAE) model. In a murine model of cardiac transplantation, high-salt diet is deleterious to immune regulation and precipitates rejection by reducing the proportion of Tregs via SGK1 activation and consequent FoxO1/FoxO3a phosphorylation.